French Republican Calendar o 1794, drawn bi Philibert-Louis Debucourt. 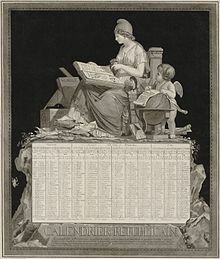 The French Republican Calendar (French: calendrier républicain français) or French Revolutionary Calendar (calendrier révolutionnaire français) wis a calendar creatit an implementit during the French Revolution, an uised bi the French govrenment for aboot 12 years frae late 1793 tae 1805, an for 18 days bi the Paris Commune in 1871. This page wis last eeditit on 7 September 2015, at 01:36.